We can’t do it instantly. It takes time. Trust is built in a series of very small moments. We have to stack trust up brick by brick. And take our time over it. Where, though, do we find the bricks? And how do we use them? For that, I’ll take you on a deep dive. Come with me deep into our limbic system. Welcome to Amygdala country. That is where Trust lives. The Amygdala plays a primary role in processing our emotional reactions and decision-making. Trust is settled by the Amygdala within a fraction of a second. Trust is a feeling. Trust is choosing something that is important to us and making it vulnerable to the actions of someone else. When we trust, we take a risk. So, how do we convince others, to take a risk with us? How do we convince them to trust us? We have to earn their trust. Which takes time. Knowledge and expertise by themselves do NOT create trust. It has been shown that the people we trust the most are not those who know but those who communicate that knowledge in a meaningful way. What matters is how we communicate. You can find more details in my videos on how to present the most suitable type of video. Because we are dealing with feelings, just Doing won’t do. The basis is how we have to Be. Help others; putting this differently, we have to default to “yes” so that our first thought always is: how can I help the other person? Patient and take the time to build trust. With these foundations, with these attitudes in place, we can now go and Do. SMILE, but the smile must be authentic. There you have the main building blocks to create Trust, to help others make the decision to take a risk with you. And, yes, these building blocks can be transferred online. How do we do this? Simple, video by video by video. Do you have any further questions? Would you like me to cover specific topics in future videos? Do you wish to be notified when the next video in this series will be published? I’ll be delighted to answer all these questions and will reply as quickly as possible. Just use the form below to get in touch. 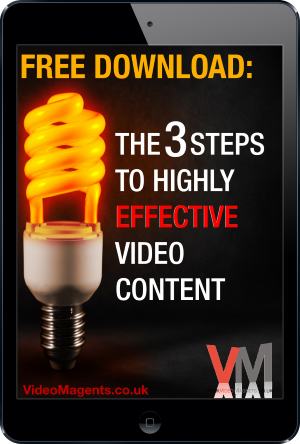 Download the exact strategies I use to create the most highly converting video content for my Professional Services clients. Next post: What Is the Cost of a Video?